Join us for our first workshop of the year! 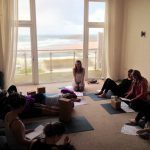 Our Seasonal Health Yoga Workshops help you to find connection with nature and our environment through movement of your body (asana), deep breathing techniques (pranayama) and guided relaxation (meditation). As your Seasonal Yoga teacher, Jen will encourage you to listen closely to your body and its needs at this time of the year. In Winter we look to support our Water Element and boost the health of our Kidney & Bladder systems to nurture our central nervous systems and the stress responses of the Adrenal Glands. Expect a restful afternoon filled with slow flow vinyasa, yin yoga and other restorative practices! An light organic and seasonal meal will be provided after the workshop, please let us know in advance if you have any dietary needs. Spaces limited so booking advised asap! Payment in advance to: Jennifer Harvey, 11362268, 30-90-34, ref: “your name” followed by “workshop” or through the booking system app.